* Scored nearly 23% of the total runs put up by India (with a batting average of 102.84) in the 21 Test matches won under Ganguly's captaincy. This is the highest percentage contribution by any batsman in Test cricket history in matches won under a single captain where the captain has won more than 20 Tests. * Only player to score a century against every Test playing nation away from home (until the ICC decides to add more nations to the list of Test playing nations his record can only be equalled, not broken). * Involved in highest partnership made away from home for any wicket for India with vice captain Virender Sehwag of 410 runs vs Pakistan at Lahore in 2006 (the highest partnership between a captain and the vice captain). * He is the fastest to reach 9000 runs in Test cricket. In all he took 176 innings to do this, bettering the previous record set by Brian Lara by 1 innings. 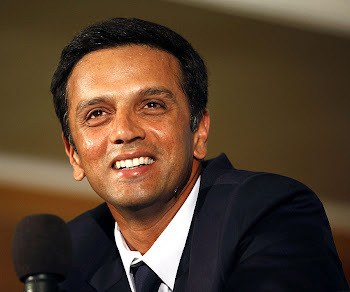 * Dravid is one among the only three batsmen to hit Test centuries in four consecutive innings. The other two are Jack Fingleton and Alan Melville. Dravid achieved this by hitting scores of 115, 148, 217 and 100* in three successive matches against England and one against the West Indies. Only Everton Weekes, with centuries in five consecutive innings, has achieved a longer sequence of consecutive Test hundreds. * With scores of 50 or more in 7 consecutive Tests Dravid bettered the previous Indian record of 50+ scores in 6 consecutive Tests for a single batsman. This record was shared by Vijay Hazare, Chandu Borde, Sunil Gavaskar, Dilip Vengsarkar and Sadagoppan Ramesh. As of October 2006 this streak is unbroken.